Grab your significant other, your best friend or the whole gang and spend the most spectacular Saturday a Culinary Enthusiast can imagine along the most famous beach front condo strips in Florida. 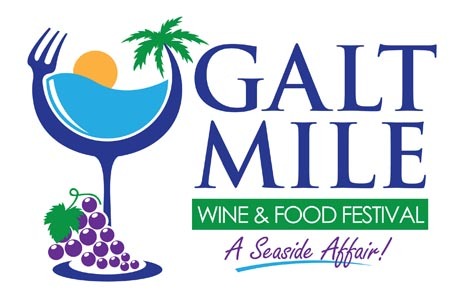 Please your palate, step into your stride and mingle among the best chefs in South Florida at the 2nd Annual Galt Mile Wine & Food Festival. With the cool Atlantic Ocean waters as the backdrop, this intimate festival will give you a unique up-close and personal experience of tasting dishes from South Florida’s Top Chefs. Learning from the masters themselves during their live cooking demonstrations. Enjoy artisan wines, craft beers & spirits and distinctive food tastings from South Florida's Top Chefs, Live Cooking Demonstrations in IKEA Kitchen Alley, wine pairing explanations and cultural revelations abound as you meet and mingle with some of the most brilliant sommeliers and extraordinarily talented chefs. Stroll down the chef’s tables, feel the balmy breeze and savor the excitement as the sun sets and the evening ascends while listening to the live music in the background. Exotic wines and culinary feasts will embrace you in sensory delight. The Galt Mile Wine & Food Festival brings you face-to-face with those who have made their lives -- their craft. This is the time for you to dine, drink fine wine and experience A Seaside Affair! – a perfect way to spend your Saturday!